Generally speaking, a yurt is a tent because at some point, someone puts it up and, if desired, it can be taken down and moved. Yurts, however, are much stronger and weather-tight than tents. They are made with wooden lattice walls and radial rafters which are supported with perimeter tension cables and a central compression ring. All are covered with durable, heavyweight, waterproof fabric. This 30-foot yurt has two framed doors: one provides access to the yurt, the other provides access to the attached deck and a view of the lake. There are five windows in the yurt (in addition to the dome) enhancing the warm, natural lighting. The yurt is built on a wooden platform which, like the walls and the roof, is insulated for winter use and summer comfort. The yurt’s design originated on the Mongolian plateau and has been used for centuries. For more information about the structural benefits and history of yurts visit Pacific Yurts, Inc.
Why did Wilderness Wind choose a yurt? 1. For the environment. Yurts enable people to feel closer to nature while minimally disrupting it. The minimal use of materials when coupled with its circular design offers great strength. 2. For the spirit of its circular structure. The circular structure is welcoming, creative, tension-releasing, and just plain fun. There is also something beyond words that is experienced in a yurt. 3. For versatility. Wilderness Wind needed a large gathering space as well as sleeping space. The current floor plan of the yurt allows for both. Should Wilderness Wind need to adjust the floor plan in the future, all interior walls are free standing and are not required for dome or wall support. 4. For extending our open season. 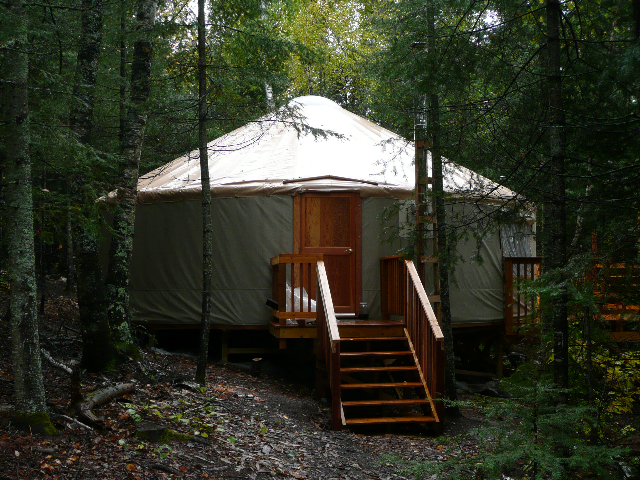 The yurt enables Wilderness Wind to extend the season and program. The North woods offers gifts in all seasons. Though we could have added a different structure to accommodate larger groups and accomplish the above interests, a yurt can be insulated to provide year-round use. 5. For future visions. 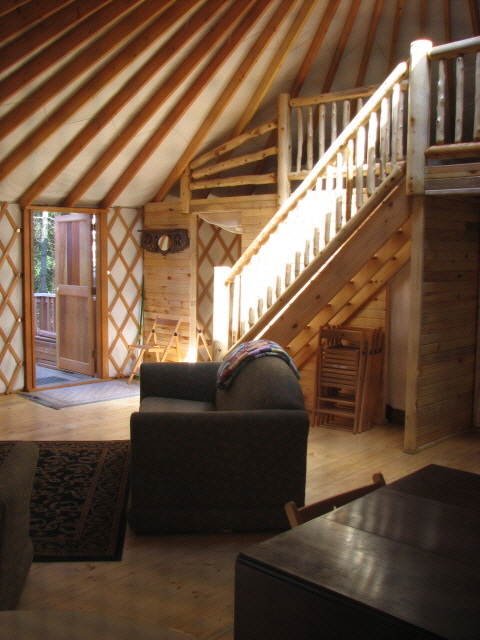 Inherent in their design, yurts allow for move-ability. Though Wilderness Wind is not planning on moving it any time soon , should the needs and facilities of Wilderness Wind change, the yurt can adjust with us while leaving a minimal trace. Come celebrate the yurt with us and try it out for yourself!